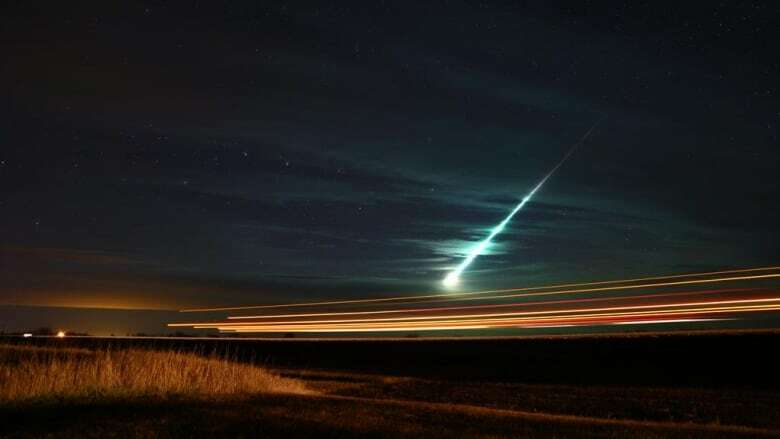 People in the province are talking about a fireball that streaked across Saskatchewan skies last night. It was a Taurid meteor that lit things up around 8:40 p.m. CST and was visible from Saskatoon to the Weyburn area. Darren Sauer was driving on the highway southeast of Kelvington, Sask. when he saw a bright light in the sky. "Stuck my head out a little farther and had a look and seen a giant fireball with a bit of a trail," he said. "It got brighter and then disappeared. It was quite a sight to see." Sauer was driving with his nine-year-old daughter in the vehicle, and reassured her it was nothing to be afraid of. "When I first seen it I thought, 'Oh, lightning show,' and then I got thinking after, nah, there's no clouds around." Sauer didn't hear anything from his vehicle, but he said people in the Kelvington area were hearing booms. "They were loud enough to shake houses." Martin Beech, an astronomer at the University of Regina's Campion College, said chances are good some material got to the ground, but how much is hard to tell. The fact that people were hearing booms in the Kelvington area could mean material landed near there. "These are all indicators that material did get to the lower atmosphere," Beech said. "Most of it would burn off in the upper atmosphere. That was the trail and the flash that people were seeing." Beech said there is some instrument recording set up in Canada that can detect sonic booms and figure out where the event took place. He hopes that information will be available soon. Skygazers say it's a particularly good year for the Taurids — so named because they appear to come out of the Taurus constellation. The meteor shower will continue for the next few days, but Saskatchewan skies are clouding over, so the golden opportunity may be over. Meanwhile, as Sunday evening's meteor lit up the skies, it also lit things up on social media, with a variety of people tweeting about their sightings and a smaller number posting photos. Among the lucky shutterbugs was Bill Allen, of the Ralph area near Weyburn, who captured a spectacular image of the fireball. That was a badass meteor that just burned up over North <a href="https://twitter.com/hashtag/YQR?src=hash">#YQR</a>! Just saw a crazzzzzy meteor over <a href="https://twitter.com/hashtag/yqr?src=hash">#yqr</a> . Super bright. Thought it was a plane going down at first!